We all consume a lot of energy (is consuming the right word if energy is never lost?). Anyway, energy is getting more and more expensive! But not only energy is expensive, also the electronics to measure the consumption (smart metering) are expensive. 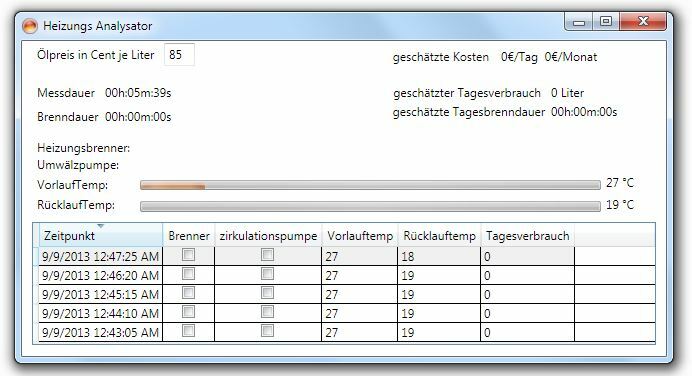 So I made my own smart metering device for my oil fired heating with some "left over" parts and an own software to interpret the data. This system is very basic, it took me just a weekend from the idea to the realization and it is not very accurate but it is giving you an idea how much you consume and this is giving you the possibility to play a bit with your Heating. You can try to change some settings at the heating, you can turn the heating off in some rooms and measure how much oil this is saving. All in one I made it to decrease the oil consumption (~10%) which in my eyes is very successfully. I am measuring the temperature from the heating and back with to PTC resistors to generate a voltage which is linked to the temperature (unfortunately not very linear but as they have to work only in a relatively small bandwidth its easy to linearize the values, also there is no need to be absolutely accurate). Besides the temperature I measure if the blower is operating. As I know the average consumption of the heater I can estimate the consumption over a longer period by measuring how long the blower is operating. I use a AVR NET IO to get the information into the network. I then developed a Application to read the data and to make the calculations. You can insert the price of the oil to calculate with €. The screenshot below was taken in autumn so the temperature is low also the blower was not operating in the measurement period. I will upload a better screenshot in winter. Maybe I will have the time to improve this project. As the system "knows" how much oil had been consumed approximately it could (or measure 🙂 ) how much oil is left. If it downloads the current oil prices and the trend it could calculate the best time to fill up the oil tank.